Looking for things to do around Fort Bragg, North Carolina? There are plenty of attractions and activities to keep you busy, whether you are moving to the area or just visiting. The United States Army base Fort Bragg in North Carolina is home to more than 50,000 active duty service members, the world’s largest military installation population. The U.S. Army Forces Command, the U.S. Army Reserve Command, Pope Army Air Field, and the Womack Army Medical Center are also at Fort Bragg. The 251-square mile base is located in Cumberland County, northwest of Fayetteville. Fort Bragg has a huge presence in the Fayetteville community and the entire Cumberland County area has a rich military history. It’s no wonder that many of the local attractions pay tribute to the area’s military past and the patriots who served our country. 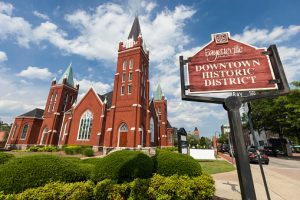 Fort Bragg has a huge presence in the Fayetteville community and the entire Cumberland County area has a rich military history. 82nd Airborne Division War Memorial Museum – This museum is dedicated to educating visitors about the 82nd Airborne Division, an active-duty modular airborne infantry division of the U.S. Army stationed at Fort Bragg. There is a self-guided gallery filled with artifacts, photographs and other historical items that tell the story of the Division, from its founding in World War I to the present day. Visit the website for operating hours and additional information. North Carolina Veterans Memorial Park – Located in downtown Fayetteville, this park is the first state park dedicated to military veterans from all branches of the U.S. Armed Forces. There are natural and architectural elements in the park, such as the Oath of Service Wall, a Reflection Wall, Veterans Color Garden and more, that represent the state and symbolize and pay respect to the veterans and the state’s citizens. The trail also brings you to several historical markers, as well as the Museum of the Cape Fear Historical Complex, the Averasboro Battlefield and Museum, and the Special Operations Memorial Plaza. Explore the military history of the Fayetteville, NC area by following the Patriots, Past & Present Trail. Arnette Park – With 100 acres of natural woodlands and recreational amenities, Arnette Park is the place to be for biking, walking, golfing, baseball and much more. Cape Fear River Boat Rides – A Flotilla Commander of the local Coast Guard Auxiliary offers 2-,4-, and 8-hour boat rides on the scenic Cape Fear River. Rides start at Riverside Marine at Cambelton Landing and group discounts are available. If you want to add some excitement to your Cape Fear river trip, travel to Lillington and visit Cape Fear River Adventures for flat water and whitewater kayaking, scenic rafting and lazy river tubing. Golf – The Fayetteville area has numerous golf courses that offer reasonable rates and excellent conditions. Check out Cypress Lakes Golf Course, Bayonet at Puppy Creek, Anderson Creek Golf Club and Gates Four Golf & Country Club. Be sure to inquire about military discounts. Mountasia Fantasy Golf & Games – Challenge yourself with two 18-hole miniature golf courses that take you through caves, waterfalls, bridges and other obstacles. Want to take the mini-golf fun indoors? Visit Pirate Black Light Golf located at the same address. Splash Pads – Bring the little ones to cool off from the North Carolina summer heat at one of the local splash pads. There are splash pads throughout the area including the J.S. Spivey Recreation Center, the Massey Hill Recreation Center, Myers Recreation Center and others. CAMEO Art House Theatre – The historic CAMEO theatre screens art, independent, foreign and classic films. It has velvet-covered cast iron opera-style chairs and also hosts concerts and special events. Cape Fear Botanical Garden – The Cape Fear Botanical Garden is a beautiful place to visit, whether you want to learn about nature or simply enjoy a peaceful 80-acre riverside oasis filled with stunning specialty gardens and ornamental plants. Military save $1 off regular general admission fee. Fascinate-U – Children toddler age through age 12 will love this museum designed just for them. Kids can enjoy a “mini-city” that encourages interaction and creative role-playing. Exhibits include a pretend bakery, post office, garden plot, grocery store, Army post and much more. Children will learn about the justice system, healthy eating, emergency services, shopping, safety and other important topics. For additional information about things to do around Fort Bragg, North Carolina, check out the tourism website, Visit Fayetteville NC. Omni Financial does not endorse, recommend or imply affiliation with the listed companies, organizations or events.